On January 19, 2017, the Outsider Art Fair celebrated the 25th Anniversary edition of Outsider Art Fair New York, the original fair dedicated to the advancement of both celebrated and newly discovered self-taught artists from around the world. A VIP Early Access Preview was held at the Metropolitan Pavilion with a select group of tastemakers from the art, culture, fashion, and entertainment milieu, which saw a record-breaking attendance of 3,500 – a 20% increase from last year. “Art collectors, professionals and art lovers can’t get enough of outsider, art brut and folk art. It’s a great fair with the highest quality and we expect strong attendance all weekend”, said fair Director, Becca Hoffman. At the preview, notable galleries noted record sales, such as James Barron Art, who sold four works by Janet Sobel within the first half hour, and groups of Norris Embry works on paper. “The energy of the fair is fabulous; we’re meeting new collectors, as well as welcoming old friends. This is our first time exhibiting at the Outsider Art Fair, and it will definitely become a yearly tradition,” said James Barron. 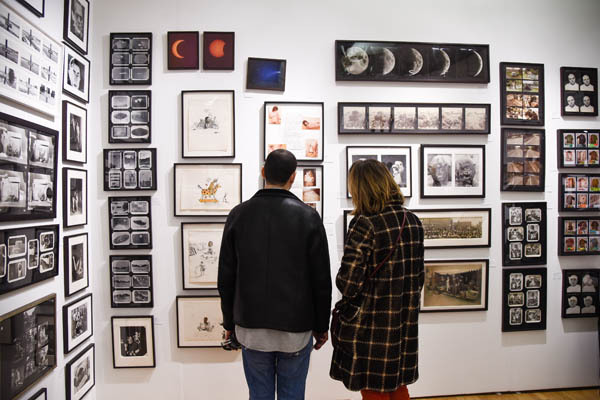 A highlight this year is critic Edward M. Gomez’s curated space, The Outsider Art Fair: 25 Years, a celebration that looks back at and honors the fair’s history, with one work of art representing each year of the fair. Each work on display was actually shown at the fair in the year it represents in this retrospective survey, and in several cases was part of a group of works by an artist who made his or her debut at the fair in its designated year. Also new this year is a special curated space titled The Quilts of Gee’s Bend, presenting the work of a small, rural Alabama community of mostly descendants of slaves, who for generations have produced hundreds of quilt masterpieces. Using recycled work clothes and dresses, feed sacks, and fabric remnants, the women composed bold geometries that are a visual testament to the community quilting groups and the aesthetic lineages of local families. Wide Open Arts also acknowledges the unusual circumstances of the Presidential Inauguration and its concurrence with this year’s fair. “As always, the Outsider Art Fair will embody the vigorous spirit and commitment that has made it a standout since 1993. The New York fair anticipates tremendous enthusiasm from its core audience as well as the growing number of contemporary art lovers who have continued to see self-taught art at more major museums and international exhibitions than ever,” notes Wide Open Arts CEO, Andrew Edlin. The Outsider Art Fair is the original art fair specific to self-taught art created outside the mainstream. Founded in 1993 by Sandy Smith, OAF soon became a critical and commercial success. Recognized for its maverick spirit, the fair has played a vital role in building a passionate collecting community and for expanding the awareness and recognition of self-taught art in the mainstream art world. In 2012, OAF was acquired by Wide Open Arts, a new company formed by art dealer Andrew Edlin. Its debut edition in 2013 saw the fair relocated to Chelsea and included guest curatorial projects and the OAF Talks program. OAF continues its tradition of presenting top dealers with prime examples of works by both legendary and newly discovered artists. The 2013 fair enjoyed rave reviews and more than tripled previous attendance levels. Propelled by this success, Wide Open Arts took the fair to Paris where it just presented its 4th edition, helping to reinvigorate the city’s long tradition of recognizing and championing art brut and self-taught artists.